The Smelting of Silver Ore from Hilderston Mine; A Lead Smelting Site at Haltwhistle Hill, Allendale; Swan Bank Colliery, Halifax; A Smelting Miscellany No.2. 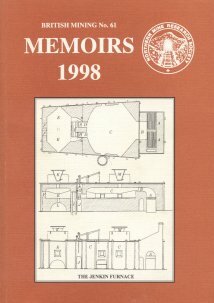 ; Mortality in Cornwall; Smelt Mills of the Yorkshire Dales - Keld Heads and Preston Mills; Roofs of Nenthead Smelt Mill; Kirk Michael Mine in the Isle of Man; The Jenkin Furnace at the New CB Mill, Arkengarthdale, Yorkshire; Stotfield Burn and Brandon Walls Mines, 1872-1882; The Development of the Mickley Colliery; Thomas Dodds - 18th century mining visionary or profiteer? ; Weights and Measures used in the lead industry; Frenchmen Student Engineers in Industrial Britain: A Preliminary List of Tours from the MS Register of Deposited Journals at the ɣole des Mines, Paris.